Those blessings came to us at a high cost. who gave everything so that we could be free. Flags are flying as we honor you today. We have a video prayer for our country by Russ Weaver. We come to bow our heads in respect to you, and thank you for our great country. 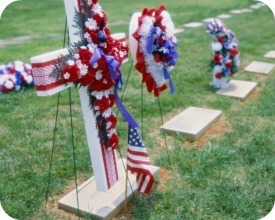 Lord, we come before you today remembering our country's heroes both dead and alive. We purpose to make this day a time to show honor to the men and women whose sacrifice has helped to keep us safe and free. We acknowledge their bravery, and we want to recognize the sacrificial contributions of each one. Stir our hearts, Lord, with patriotism and thankfulness as we think about our country's treasures lying in graves beneath our nation's soil and the soil of lands far away. 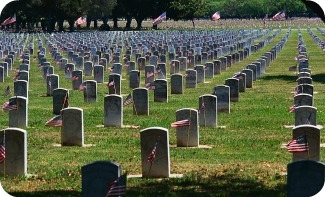 May we be inspired to be more abundant in our giving as we commemorate their lives of service to others. They gave the ultimate sacrifice, and we respectfully remember them today. Lord, we lift up the families and friends of those who gave their lives for their country. We ask you to minister to the deep longing of those who grieve. We ask you to bring your peace and supernatural comfort to each one as they recall their former happy times together. As we observe this day, we want to again respectfully honor all the men and women who presently serve in our armed forces. May they feel appreciated, and may they be powerfully protected this day and every day. and Prayer for our Country. We will not forget our heroes. We added this video prayer. "Praise the Lord, who is my rock. He trains my hands for war and gives my fingers skill for battle. He is my shield, and I take refuge in him." For prayer and devotionals for other holidays see our "Special Prayers" page.